Courageous Companions is a leader in providing specialty service dogs for clients with PTSD as well as other disabilities acquired during service. We take on some of the most difﬁcult and unique service dog projects and train our dogs for individual needs. We take the situation of the family into consideration. Each case is assessed and placed in order of priority with individuals with life threatening conditions receiving the highest priority. We ensure that all K9s selected to train life-threatening meet the standards required by Master Trainers at MSAR. a mix of the above. 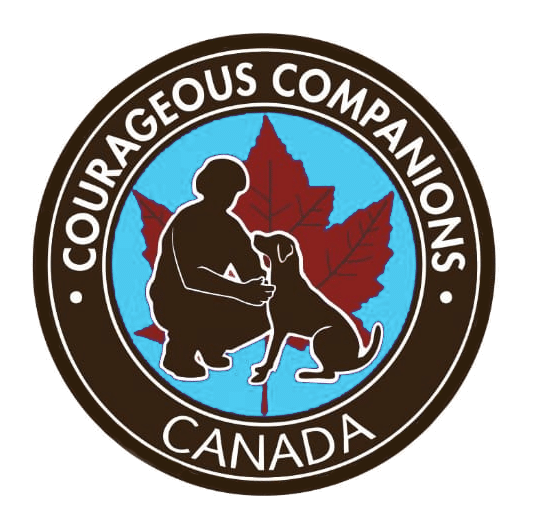 Courageous Companions uses the training services provided by MSAR, a First Nations founded K-9 training facility located in Manitoba (www.msar.ca). A Courageous Companions Elite Service dog is a very special animal with an immense amount of training put into it. On average a dog will receive 12 – 24 months with one of our trainers. These dogs are never left alone, as they live with their trainer and other animals. One of MSAR’s master trainers, George Leonard, uses his balanced pack (an aggressive, passive, dominant and a happy-go-lucky dog) as a training tool in addition to cats, horses, cows, goats, etc. All our dogs live in a family environment during training. They are not isolated in kennels for long periods as we believe they need to be in the working environment as much as possible to properly socialize and train for service. Our dogs live and go everywhere with our trainers. Our training methods are based on our extensive ongoing studies to improve K-9 service performance. Our training methods are based on modern training principles. Each dog must be specifically trained. After a lengthy interview process consultation with their medical team, we then determine the appropriate service task, program, and training method and then start training a service dog specifically for the target person’s disability. Courageous Companions believes this is the best method of training by the proven success we have had in training our service dogs and the life changing effects the dogs had on our clients. Click on the Training-and-Certification-Standard to download the Standard we use for the training and certiﬁcation of Courageous Companions Service Dog teams. 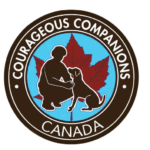 Courageous Companions is a registered charity which provides quality trained certified Service Dogs to Military Veterans and First Responders.